Cristina Gutiérrez, a 26year-old dentist from Spain, has become a women-superhero of the Dakar 2018! The Rally-Lady, together with her navigator Gabi Moiset, was the only women driver to finish the Rally in the cars. "It seems I'm dreaming," she repeated over and over again. The Dakar, Cristina, Gabi and her Mitsubishi, a special story every day, a fight with everything, every day - and a spectacular roll, luckily filmed, just in the beginning of the Rally. "This second week has been very hard, an authentic odyssey in which everything has happened to us," reported Cristina Gutiérrez after the last stage. Some days she had to drive for almost 20 straight hours, in other days she had to be towed by the assistance truck... but nothing and no one could beat Cristina who has shown, once again, that she has an iron moral and an incredible capacity for suffering. "In five days I maybe slept a little more than two hours," she said with a smile. While the factory drivers relaxed in hotels or mobile homes, Cristina and Gabi decided most for their Mitsubishi Pajero - to spent their holidays in. "The 'bug' (as Cristina calls her Pajero) has been phenomenal and the whole team has done an incredible job from the first to the last stage. Without their help it would have been totally impossible for me to finish this difficult Dakar, in which we had to overcome really complicated situations. Also a big thanks to Palibex (as Spanish Mercedes Truck-Team) which helped me in critical moments," she stated. But the best partner in critical moments was her codriver Gabi Moiset. "Gabi was codriver, navigator, mechanic and also psychologist, helping me overcome the worst moments." From his site, the experienced co-pilot acknowledged that "I loved sharing this experience with Cristina, this adevnture was a real blowoff!" 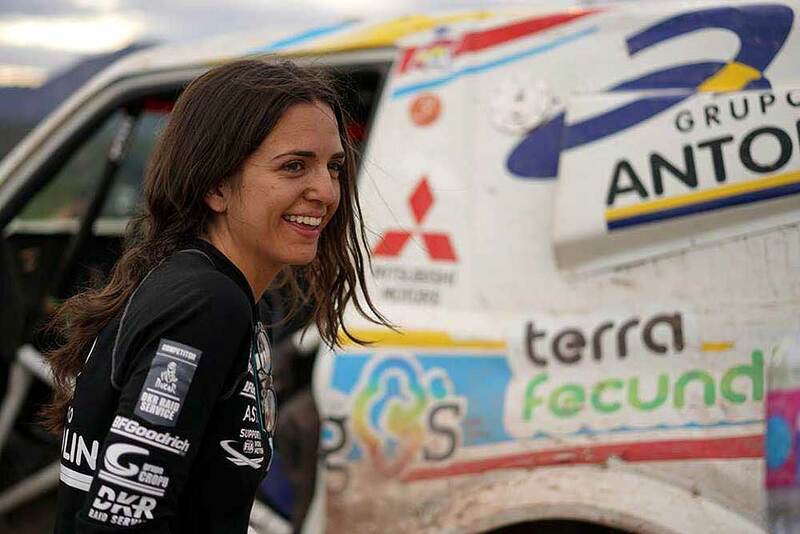 2017 Cristina Gutierrez competed the first time in the Dakar Rally, even if the most experienced competitors called it the easiest Dakar Rally ever (due to many cancelled stages), she finished as 44th. In 2018 in the 40th edition, the rally was called "the toughest Dakar in South America ever, like in the good old days in Africa" - and here in her second participation she finished 38th and second in the T1.S category (Improved and Off-Road Vehicles). "We are very happy with all the support we received during the race, this has given us the strength to continue forward day after day," finalized Guiterrez.